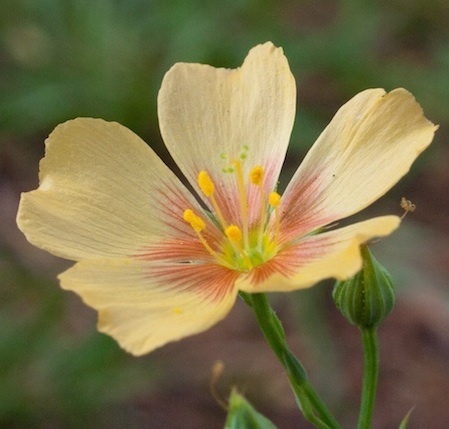 This study investigates the reproductive biology of, and effect of heterospecific pollen from introduced Euphorbia esula on, Linum rigidum, an annual plant native to western and central North America. Breeding-system studies revealed that L. rigidum is self-compatible, with similar pollination success, fruit set and seed set for flowers pollinated with self or outcrossed pollen. Untreated flowers not exposed to pollinators set seed, albeit at a lower rate than hand-pollinated flowers, indicating that L. rigidum can autonomously self pollinate. Experiments investigating whether heterospecific pollen transfer from E. esula interferes with pollination of L. rigidum indicated that large amounts of heterospecific pollen receipt 2 - 4 hours prior to conspecifc pollen receipt reduced fruit and seed production, but that small amounts of heterospecific pollen or larger amounts received immediately prior to conspecific pollen did not affect reproduction. Pollen of E. esula was observed to germinate on and penetrate into L. rigidum stigmas and styles. Nevertheless, Euphorbia esula is unlikely to interfere with L. rigidum’s reproduction because L. rigidum is self-compatible, capable of autonomous self-pollination, and unaffected by receipt of small amounts of Euphorbia pollen.